Each year in November, Manatee County celebrates its heritage with Farm City Week. Local visual artists will be on exhibit. OPENING RECEPTION ON SATURDAY, NOVEMBER 19th FROM 6-9PM. On Saturday evening, November 19th, from 6-9PM Palmetto Art Center (PAC) will celebrate, through art and music, Manatee County and the City of Palmetto’s association with its agricultural past. Each year in November, Manatee County celebrates its heritage with Farm City Week. 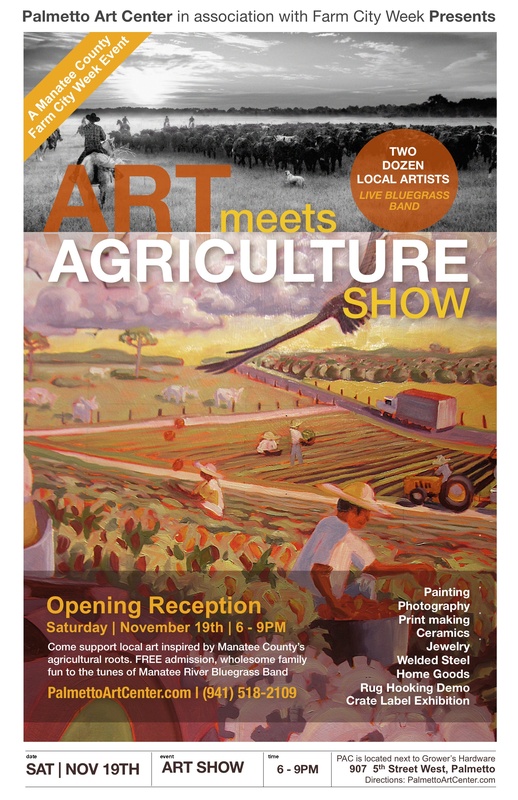 PAC wraps up the week long celebration with an enlightening art show entitled ART meets Agriculture. Local visual artists will be on exhibit and members of the Manatee River Bluegrass Band will strum from 7 – 9PM. The City of Palmetto Proclamation states: “…Farm City Week provides a unique opportunity for those in agricultural enterprises and their city neighbors to become better acquainted and to work together for a better understanding of their interdependence on each other…” PAC strives to better acquaint the county and the City of Palmetto’s community with the work of local artists and their impressions of our agricultural past and future. Tim Jaeger, a professional contemporary painter of the arts group sARTq, award winning Florida Cowboy photographer, Jimmy Peters, agricultural-inspired canvases, photography, ceramics and milled steel are a sampling of the art on exhibit. PAC’s ART meets Agriculture show opening reception is open to all who are looking for a social evening of family friendly fun. There is no admission fee. Select artwork, wine and soft drinks will be on sale. For those who cannot attend the opening reception, PAC Gallery is open Monday – Friday 11AM – 2PM, closed on Wednesdays. ART meets Agriculture show will be on show until November 29th, 2011.